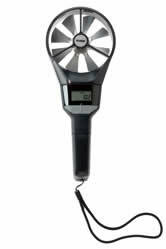 The Alnor® Rotating Vane RVA801 is a light weight, robust, and simple to use rotating vane anemometer that provides accurate and reliable readings every time. The RVA801 measures air velocity, air volume and temperature using simple button operation and displays readings in metric or imperial mode from 50–6000 ft/min (0.25–30 m/s). It features an attached swivel head that rotates so the display always faces the operator.